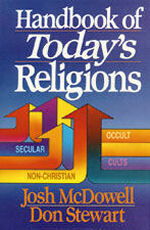 Books | Handbook of Today's Religions | Watchman Fellowship, Inc. Contents: 567 pages, Index, Footnotes. A clear, concise reference work that will provide the Christian reader with practical insights into and a comprehensive analysis of today's cults, the occult, secular and non-Christian religions. Compiled from four major volumes, this book is an excellent overview of nearly all of today's major theological threats to the Christian church.